Quantum is a story that started out in Melbourne, Victoria right here in Australia. It was back in 1975 where extensive research was conducted through the Melbourne University in a quest to be able to produce sustainable hot water solutions in the Australian energy market. The study was based upon using heat pump technology to produce hot water. Heat pump technology is relatively new to Australia and so therefore many years of research and developments was needed. After many years of extensive research and development Quantum produced heat pump hot water technology. A system today which reduces energy consumption and produces lower green gas emissions while successfully creating hot water. 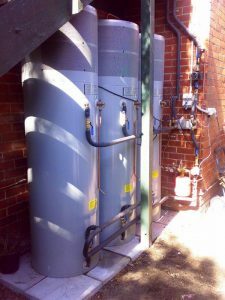 It was back in 2008 when the South Australian government changed the rules about electric hot water replacements and it was at this time heat pump technology really took off in Adelaide. Although not as popular today as the rules surrounding electric hot water replacements have been changed back you will still see plenty of Quantum heat pump hot water services in use around Adelaide and in the Adelaide Hills. Today Quantum produce many other forms of heating hot water with products such as pool heaters, solar hot water, electric hot water and a new product to the hot water market for Quantum is the instant gas fired hot water services. There are currently two models which Quantum offer in their instantaneous hot water range with either a 20L per minute model or a 26L per minute depending on your demands. These new models feature Japanese technology and offer a 6-star energy rating. As these Quantum instantaneous hot water systems are relatively new to the Adelaide hot water market you may not have seen too many of these installed but as time goes on there is certain to be many of these new instant hot water systems installed. It’s not only the domestic range of water heating which Quantum provide products to they also produce systems which can easily keep up with your commercial demands. The Titan range of hot water systems provide larger capacity systems for hotels, shopping centres, restaurants, pubs, child care centres, factories, industrial plants, remote locations and commercial developments. The units in this range can be banked together using manifold processes to provide large amounts of hot water on demand while still only using a small amount of energy. The Titan range of commercial hot water systems can produce over 1500L of hot water in the first hour and an additional 500L of hot water in the second hour. If you have a situation that requires a large amount of hot water, there is a Quantum system that can be tailored to suit your needs. With over 30 years of ongoing research and development Quantum today provides dependable hot water solutions to all industries throughout Australia.